Param Purush Puran Dhani Soamiji Maharaj was pleased to declare the Satsang open to general public on the occasion of Basant in the year 1861. This can be said to be the day when Radhasoami Faith was started. To mark the completion of 150 years of this momentous occasion, a year-long celebrations were organised in Dayalbagh and in all the Branches affiliated to it beginning from Basant 2010 and culminating at Holi 2011. 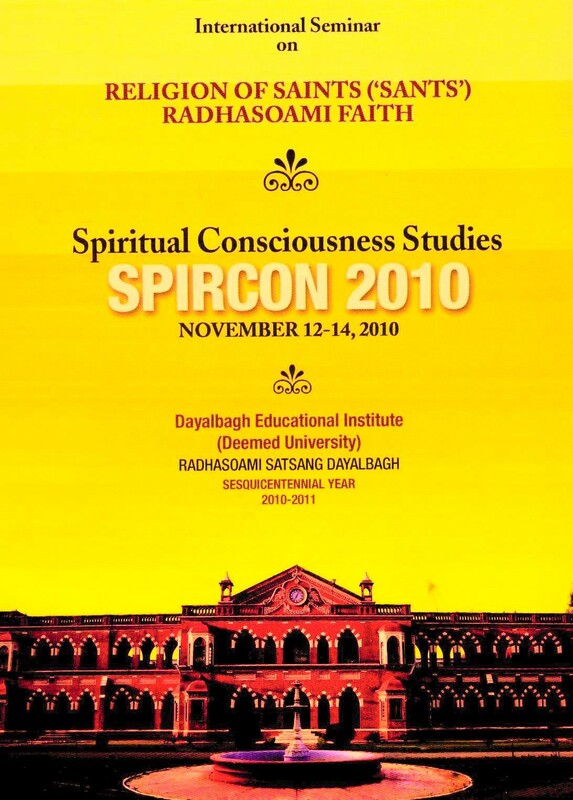 Coincidentally, during this period Radhasoami Satsang Sabha, which is the main organising body of Dayalbagh Satsang also completed its 100 years in March 2010. Apart from a Special Meeting for thanksgiving held on 26th March, 2010 (the precise date) at Dayalbagh, a special session of the Sabha was also held at Murar which is the birth-place and home of Param Guru Sarkar Sahab, the fourth Revered Leader of the Faith and under whose inspiration the Sabha was formed. (3) the practice of Surat Shabda Yoga under the guidance of a living Sant Satguru as the way for attaining salvation. Accordingly the letter of Invitation was sent to Revered Leaders of seven Centres and also the draft of proposed Declaration on the lines of the one adopted by the Sabha at Murar was sent for consideration. Revered Baba Kehar Singh Ji Maharaj of Taran Taran and Revered Kanwar Singh Sahab of Dinod participated in the Conclave. The Revered Leaders of Beas and Sawan Kirpal Ruhani Mission Delhi were going to be out of India on the dates set for the Conclave. Revered Baba Gurinder Singh ji Maharaj of Beas promising to visit Dayal Bagh before the end of the celebrations did come on 16th March, 2011. He met Revered Dr. Prem Saran Satsangi Sahab and the two Leaders signed a General Statement declaring that “in all humility the two Satsangs declare once again their adherence in true letter and spirit to the guidelines contained in the Joint Statement (of Param Guru Sahabji Maharaj and Baba Sawan Singh ji Maharaj signed in 1932).” Revered Babaji was welcomed by President, Radhasoami Satsang Sabha on behalf of Satsangis of Dayalbagh of whom 7000-8000 were present and Satsang held. Sawan Kirpal Ruhani Mission has conveyed full support for Murar Declaration. Revered Agam Prasad Mathur Sahab of Pipal Mandi participated in the SPIRCON Seminar as Chief Guest of Honour and has indicated his support for the Declaration. Mahantji of Tulsi Math of Hathras attended SPIRCON throughout. Representatives of Soami Bagh and Dr. Hazra Group too were invited of which the latter attended SPIRCON. At the Conclave held on 14th November, 2010 a Declaration was issued signed by Leaders of Dayalbagh Satsang, Dinod and Taran Taran Satsang. The following is the text of the Declaration which was signed by Revered Dr. P.S. Satsangi Sahab, Revered Baba Kehar Singh Sahab and Revered Kanwar Singh ji. “Radhasoami Dayal incarnated Himself in the year 1818 in the form of Param Purush Puran Dhani Soamiji Maharaj in this world for the redemption of jivas. On Basant day in 1861, He declared open His Satsang to public in general which was an event of unparalleled Mercy since the beginning of creation. By His grace Satsang has been making steady progress ever since. The Nij-dhar has continued to function in different human forms continuously. We have the assurance that the Nij-dhar will not return until it had completed its task of redemption of all the jivas. (C) the practice of Surat-Shabda-Yoga** under the guidance of a living Sant Satguru as the way for attaining salvation. (1) That all Satsang Centres and the Satsangis affiliated to them would maintain and promote brotherly relations and affectionate behaviour towards the followers of Radhasoami Faith attached to different Centres. (2) Each Centre will continue to make separate arrangement for Satsang as it deems proper. It will be open to a Satsangi to join any Centre according to his/her inclination and to follow the lead of the Sant Satguru Whose Guidance he/she wants. (3) Each Centre will be free to manage its properties according to its wishes but access to the shrines under their management will be provided to the followers of the Faith attached to different Centres. (4) No Satsangi by any written word or utterance will make any statement which may be derogatory to other Satsang nor try to instil his/her ideas and feelings in the minds of others.